Where Will the Minsky Moment Occur? Which country will start the next crisis? If you have not yet read Part I: Europe's Precarious Banks Will Determine the Future available free to all readers, please click here to read it first. The true state of the Spanish economy (i.e., it is in depression) should be uppermost in our minds when we consider recent developments at Bankia, the Spanish mortgage bank formed only thirty months ago out of the wreckage of Spain’s regional mortgage banks. 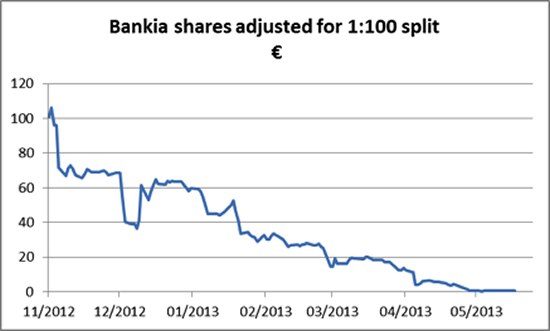 Bankia underwent a subsequent bail-out only a year ago and has been a continuing disaster, as shown by the share price in the chart below. Having fallen from an adjusted €106 to only 68 cents as recently as last November, the share price tells us that Bankia is simply bust. The new G20 bail-in rules cannot have helped Bankia hold on to its deposits; the only deposits left should be those of the small depositors prepared to rely on government insurance. 4 Comments on Where Will the Minsky Moment Occur?